I have recently been doing some reading and listening to John Seely Brown, and so much of what he has discussed in his work resonates with my own thought processes and inquiries right now. As I think about how our education system needs to change in order to promote the kind of learning that our students need, I am reminded that change is omnipresent. ‘Things’ are changing so rapidly, that ‘skills’ become redundant much faster than they ever have in history. Do we move beyond the skills to focus on ‘higher’ order thinking’ and helping students to ‘learn to learn’? I now realize after watching this video, that it is much more. Play is perhaps the most basic building block of knowledge building. 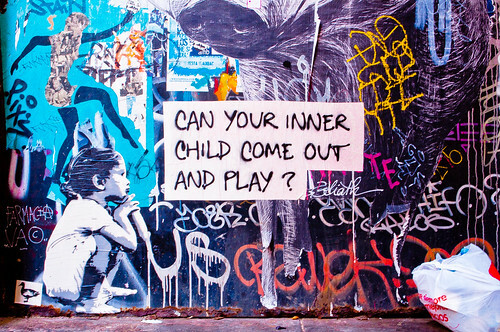 Play needs imagination, and imagination needs to be cultivated through play. Through ‘play’ students get to try new things out, ask each other what works, and what doesn’t work. The teacher provides access to new resources as needed to help students along in their processes. By ‘playing’ and sharing what we are doing, as learners we are able to witness what we are all doing.. we witness each others struggle, and hopefully gaining an understanding about what we are all going through – not just as individuals. It is through ‘play’ that we enable knowledge to be learned through concrete, and not merely abstract concepts. Our imagination can be applied to tangible elements that can be experienced by all of our senses, and not just our mids. These are also important ideas that many FNMI peoples and cultures have always held dear – the concepts known to be true –that we learn best by doing and watching others – Masters and novices alike. All with a sense of ‘humility’. In this world, humility is so important. We give credit where credit is due, and we build our own knowledge from that. We are not solely the Master of our knowledge, we are also the learners, the creators – then we quickly move on to new learning. We ‘mash-up’ the learning, and as educators, we re-purpose what we have already done in our classrooms and learning environments. We redefine and modify our learning, and expand the knowledge bases with our own creativity. Every student and group is different, therefore why would we teach the same things year after year? Next, connections to community are important as well. What we do should be done for the sake of building our communities and families, and built with our communities as well. What we do we share with our communities, and what we do is influenced by our communities and cultures. Finally, Social identity can be measured in new ways in the 21st century! Social capital and identity is being reconstructed in this day in age, by what we create and share. I was very inspired by John’s assertions that our students no longer need to be identified by what their parents ‘do’ or by ‘what they make’. Students can now identify themselves by what they create – and everyone can create something important and useful and interesting – it should not have to fall into a narrow category of isolated expectations as outlined by the curriculum. How can we help our learners to be ready to pick up new information all the time? How can we help our learners to be active participants in their learning? move beyond the specific expectations of our curriculum, and focus on the overall expectations. understand that literacy and learning takes many forms and functions – just as our physical structures do.